Halifax is home to a beautiful harbour and North America’s longest continuous boardwalk. We made our home on the Halifax waterfront for a reason—not only is it one of the most gorgeous areas of our city, but it’s right in the heart of all the summertime event action. There are tons of events happening in Halifax this summer. Here’s a list of exciting events taking place on the waterfront, plus a few from other areas of the city. Mark your calendars, because summer 2016 is going to be jam-packed with family fun! Patio season is exciting anywhere, but especially at Bishop’s Landing—thanks to our gorgeous Halifax waterfront setting, we think our restaurants have the best patio views in the entire city. With four waterfront patios in total, Bishop’s Landing is Halifax’s premier destination for outdoor dining. Which patio will you visit first? Open City 2016: Win a $150 Gift Card & Get Great Deals! 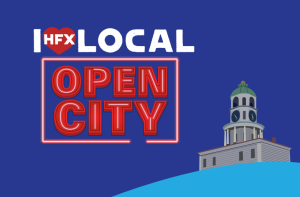 The 2016 edition of Open City Halifax is just around the corner, and Bishop’s Landing is again proud to be a sponsor of this annual event! Our waterfront community of independent retailers and restaurants celebrates local business in Halifax, and we encourage you to support your favourite local businesses during Open City 2016 on Saturday, May 7th. Here are some of the amazing deals and delicious eats you can take advantage of during Open City 2016, both in Bishop’s Landing and nearby. If you’re in a rush and don’t have time to read the whole post, here’s a hot tip you need to know—parking in the Pay & Display lots around Bishop’s Landing will be free all day on Saturday, May 7th thanks to Waterfront Development!